Last night I had another go a bread baking with a few minor tweaks to the basic recipe and I managed to turn out a couple of truly majestic tasting but diminutive white loaves. Each of my attempts at bread making yield slightly different results, some of which are better than others but this most recent effort was generally considered an excellent batch. Each time I like to vary the approach slightly to get a better understanding of how that affects the results so this time I decided to split the resulting dough between two loaf tins not using a single tin as normal. 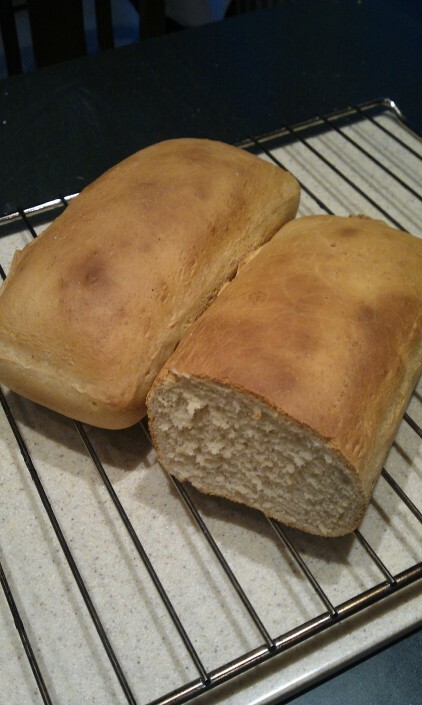 Another variation was the use of Allinson Premium White Very Strong Bread Flour which I hadn’t tried before. Maybe this explains the good results but I’m not giving up all the credit just yet. Also while leaving the dough to prove for an hour or so in the tins before baking, I decided to put them in the oven which had retained a little heat from use earlier in the evening. The oven wasn’t by any means hot but just warmer than the kitchen and I believe this also influenced the results. I can’t let Allinson’s get all the glory! If there is a downside to this batch of bread I would have to say it was the loaf size. I know we should value quality rather than quantity but I would have prefered both in equal amounts! Next time I think I will increase the quantities used by about 50% so that each loaf is visually just that little more impressive. Another planned future variation will be to experiment with adding seeds (e.g. pumpkin, poppy etc) or other flavourings before baking. I’m always on the look out for good bread recipes though so please pass them on to me!